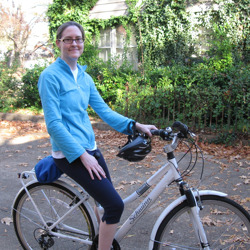 Martha McGeachy (shown on her bike), Benefit Services Manager at Rhodes College, gets to the bottom line quickly about why Rhodes has ramped up their health and wellness programs, "We think these programs serve the College and our employees by raising awareness of healthy lifestyles and building a sense of community. The benefit to our health plan is more long-term, but with diligence and patience we believe we will see good results." Rhodes is paving the way for other MBGH members by being the first to roll out the MBGH Employee Communication Campaign: Getting Quality Care. The college piloted Move More Eat Better worksite wellness program for its employees in partnership with the Shelby County Health Department and MBGH. And MBGH helped organize the annual employee health fair Rhodes held last week! But these aren't the only health promotion and wellness initiatives at Rhodes. In a deliberate plan to reach as many employees as possible with their wellness initiatives, Rhodes offers a broad array of programs including Weight Watchers at Work; monthly Power Hour sessions on stress, managing a career and personal life, financial management, and healthy lifestyles; mobile mammography; and an employee assistance program through Concern. A signature wellness initiative at Rhodes is the Faculty and Staff Health Trek Program.The Trek is a ten-month program that begins on September 1 and is a motivational tool where employees earn wellness miles for healthy activities from flossing their teeth to running a marathon. In this program employees covert healthy lifestyle choices, activities, and preventive services into "miles". Employees receive prizes as their miles add up. This virtual "trek" is across Tennessee, from Memphis to Johnson City and back and is tracked on a map. Through March, over 17,000 wellness miles had been logged! Rhodes calls its program "WellnessWorks@Rhodes" and it is clear that indeed it does!